Most of the classifications of gingival recession are unable to convey all the relevant information related to marginal tissue recession. This information is important for shaping diagnosis, prognosis, treatment planning, but also communication between clinicians. Furthermore, with a broad variety of cases with different clinical presentations, it is not always possible to classify all gingival recession defects according to present classification systems. Palatal recessions (PR) have not been classified. One of the 1 st classifications to be proposed was by Sullivan and Atkins. The basis for the gingival recession classification was the depth and width of the defect. The four categories were: Deep wide, shallow wide, deep narrow, and shallow narrow. Class IV: Marginal tissue recession extends to or beyond the MGJ. Loss of interdental bone extends to a level apical to the extent of the marginal tissue recession. An index for gingival recession  and modification of Miller's classification  had also been proposed earlier. In 1998 Nordland and Tarnow  proposed a classification system regarding the papillary height based on three anatomical landmarks (a) the interdental contact point, (b) the apical extent of the facial CEJ, and (c) the coronal extent of the proximal CEJ. In Miller's Class III and IV recession, the interdental bone or soft-tissue loss is an important criterion to categorize the recessions. The amount and type of bone loss has not been specified. Mentioning Miller's Class III and IV doesn't exactly specify the level of interdental papilla and amount of loss. A clear picture of severity of recession is hard to project. 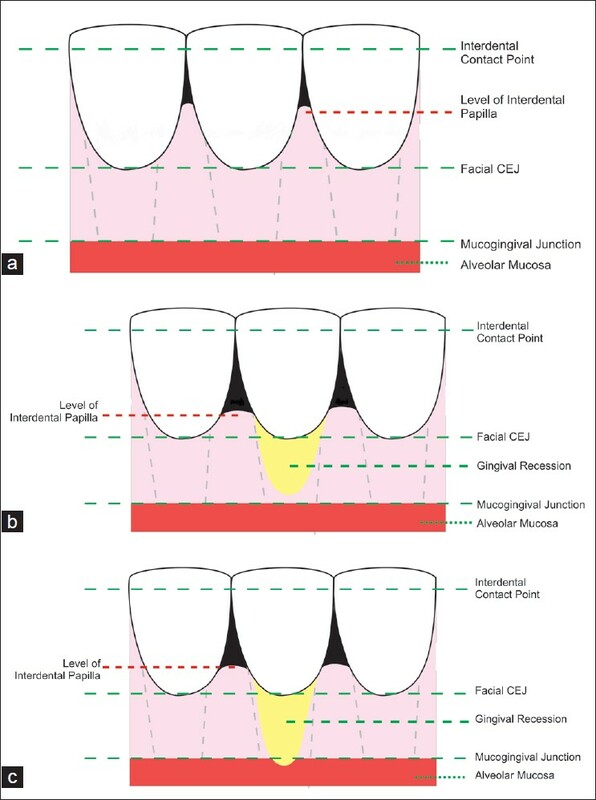 Class III and IV categories of Miller's classification stated that marginal tissue recession extends to or beyond the MGJ with the loss of interdental bone or soft-tissue is apical to the CEJ. 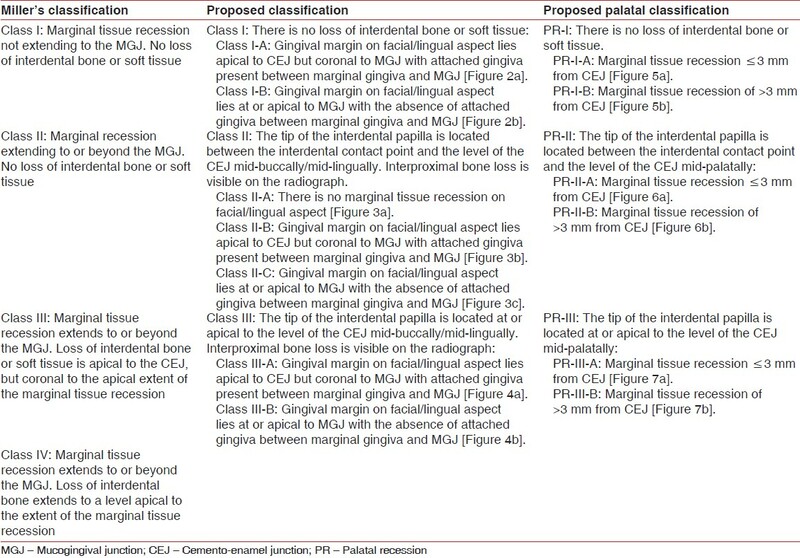 The cases, which have inter-proximal bone loss and the marginal recession that does not extend to MGJ cannot be classified either in Class I because of inter-proximal bone or in Class III because the gingival margin does not extend to MGJ. Two such cases have been presented in [Figure 1]a and b. These cases show interdental bone/soft-tissue loss, but the facial recession is not extending to or beyond the MGJ. These cases in the true sense cannot be classified as Miller's Class III. Miller's classification doesn't specify facial (F) or lingual (L) involvement of the marginal tissue. Recession of interdental papilla alone cannot be classified according to the Miller's classification. It requires the use of an additional classification system. Classification of recession on palatal aspect is another area of concern. The difficulty of the applicability of Miller's criteria on the palatal aspect of the maxillary arch can be reasoned out to the fact that there is no MGJ on palatal aspect. Therefore, a classification is required, which specifies the type of recession and can also quantify the amount of loss. The classification should be able to convey the status of the gingival recession and the severity of the condition on palatal aspect. Recession on palatal aspects changes the overall diagnosis and prognosis of a case. Mucogingival treatment of the recession may be required for reasons other than esthetics. Miller's classification estimates the prognosis of root coverage following grafting procedure. Miller stated that 100% coverage can be anticipated in Class I and II recessions, partial root coverage in Class III and no root coverage in Class IV. Pini-Prato stated that anticipation of 100% root coverage does not mean that it will occur. Root coverage percentage ranging from 9% to 90% have been reported by different authors in Class I and II recessions using different techniques.,,, Outcome of treatment may depend on other prognostic factors and categorization to predict the outcomes of root coverage in Classes I and II are not correct. Considering the above limitations, a new classification system is being proposed which is more detailed, informative and lucid. This classification system is based on an amalgamation of certain criteria of Miller's  classification with the certain features of Nordland and Tarnow's  classification. A distinct classification for gingival recession on palatal aspect is also being proposed. This classification can be applied for facial surfaces of maxillary teeth and facial and lingual surfaces of mandibular teeth. Interdental papilla recession can also be classified according to this new classification. Class I deals with marginal tissue recession with no loss of interdental bone or soft-tissue. Class II and III deal with the loss of interdental bone/soft-tissue with/without marginal tissue recession [Table 1]. Class I-B: Gingival margin on F/L aspect lies at or apical to MGJ with an absence of attached gingiva between marginal gingiva and MGJ [Figure 2]b. Class II-C: Gingival margin on F/L aspect lies at or apical to MGJ with an absence of attached gingiva between marginal gingiva and MGJ [Figure 3]c.
Either of the subdivisions can be on F or L aspect or both (F and L). Class III-B: Gingival margin on F/L aspect lies at or apical to MGJ with an absence of attached gingiva between marginal gingiva and MGJ [Figure 4]b. If a tooth presents marginal tissue recession only on facial (F) or lingual (L) aspect, the class of recession should be followed with the word F or L. When the gingival margin is coronal to the CEJ, the clinician must detect the CEJ through tactile exploration with the probe tip. The tip of the probe is positioned at 45° angle to the tooth and moved slowly beneath the gingival margin to detect the CEJ with the tactile sensation. For example, if mandibular central incisor presents with a recession of only marginal tissue on facial aspect not extending to MGJ and no interdental bone loss, it should be classified as Class I-A (F). If similar marginal tissue recession is also present on lingual aspect of the same tooth, it should be marked as Class I-A (F, L). The more apical level of interdental papilla on interproximal aspect (mesial or distal) would decide the category to which the recession should be classified in a case where different levels of recession are observed on the mesial and distal aspects of the same tooth. The use of more apical level of interdental papilla to classify gives a more appropriate idea of severity of the situation. According to the new classification, the photograph in [Figure 1]a would be classified as Class II-B (F) on maxillary right central and lateral incisors. The position of interdental papilla remains the basis of classifying gingival recession on palatal aspect. The criteria of sub-classifications have been modified to compensate for the absence of MGJ [Table 1]. PR-I deals with marginal tissue recession on palatal aspect with no loss of interdental bone or soft-tissue. PR-II and PR-III deal with the loss of interdental bone/soft-tissue with marginal tissue recession on palatal aspect. PR-I-B: Marginal tissue recession of >3 mm from CEJ [Figure 5]b.
PR-II-B: Marginal tissue recession of >3 mm from CEJ [Figure 6]b.
PR-III-B: Marginal tissue recession of >3 mm from CEJ [Figure 7]b. If marginal tissue recession of 4 mm with no interdental bone loss is present on palatal aspect of maxillary central incisor, it is marked as PR-I-B. If marginal tissue recession on facial aspect of maxillary central incisor confirms to Class I-A and palatal aspect confirms to PR-I-B, then it should be marked as Class I-A (F) and PR-I-B against that tooth. The more apical level of interdental papilla on interproximal aspect (mesial or distal) would decide the category to which the recession should be classified in a case where different levels of recession are observed on the mesial and distal aspects of the same tooth. The use of more apical level of interdental papilla to classify gives a more appropriate idea of severity of the situation. The chart shown in [Table 2] can be used to mark recession category. An arrow amid the teeth of involved papilla can mark the papilla. The aim of this classification is to answer the pitfalls of the currently used classification systems for recession and to include or help the clinicians to classify those cases, which cannot be categorized into a particular class with any of the current classifications. The limitations of Miller's classification result in insufficient depiction of clinical condition. Partial depiction leads to an erroneous diagnosis, prognosis, and hence treatment planning. The criteria suggested in the new classification assist to classify a large number of cases that cannot be distinctly placed into any category according to the current classification systems. The proposed classification system would give a broader depiction of recession. The mere mention of category would explain the position of interdental papilla and facial/lingual/palatal involvement. The cases with the varied clinical pictures can be easily classified, and the findings can be recorded in an elaborate and precise manner. Categorization of recession into groups cannot predict the treatment plan and amount of final root coverage. Although Miller's landmark article not only suggested prognosis, but also stated that ''the amount of root coverage can be determined pre-surgically using a periodontal probe.'' This hypothetical assertion by Miller has not been validated. Miller's assumption in his classification, that 100% root coverage can be anticipated in Class I and II is only speculative and does not mean that 100% coverage will occur. Results from various studies for Classes I and II recession treatment have a range from 9% to 90% of root coverage. , The prediction of the outcomes of root coverage in Classes I and II is not correct and impractical. According to Miller,  partial root coverage is expected in Class III recession, although complete root coverage has been achieved in Class III recessions. The results of various studies, many of which are contrary to the assumptions of Miller, show that categorization in a specific group cannot determine prognosis and treatment plan. The multiplicity of prognostic factors and their interactions affects the overall percentage of root coverage. The classification is based on presence/absence of specific clinical features and cannot alone determine the amount of root coverage. The diversity of prognostic factors prevents anticipation of probable percentage of root coverage in the new classification. Periodontal diagnosis and monitoring rely upon clinical parameters to a large extent. The disease classification should be able to provide clinically beneficial distinctions between conditions that have comparable clinical presentations. Application of more descriptive and detailed classification that requires recording of additional parameters may require additional time, but the clinical picture presented by details would have broader interpretation of recession which would be more beneficial and informative for the clinicians for communication and to arrive at a correct diagnosis. The additional time required to implement this classification will also aid in classifying cases that cannot be classified presently and provide clinically beneficial distinctions. The application of this new classification during the examination, diagnosis, and communication among clinicians would definitely be more informative, expressive and would have more clinical value and relevance. Although, various classification systems are in use and each system has an advantage of its own. No classification system can be complete and everlasting; with time and its continual use one realizes the advantages and disadvantages of each system. This classification is a step towards refining the existing drawbacks of the current classification. An attempt has been made so that the new system can be applied to a wider variety of cases to provide more accurate and detailed clinical picture. 1. American Academy of Periodontology (AAP) . Glossary of periodontal terms. 3 rd ed. Chicago: The American Academy of Periodontology; 1992. 2. Wennström JL. Mucogingival therapy. Ann Periodontol 1996;1:671-701. 3. Consensus Report . Mucogingival Therapy. Ann Periodontol 1996;1:702-6. 4. Gorman WJ. Prevalence and etiology of gingival recession. J Periodontol 1967;38:316-22. 5. Löe H, Anerud A, Boysen H. The natural history of periodontal disease in man: Prevalence, severity, and extent of gingival recession. J Periodontol 1992;63:489-95. 6. Stoner JE, Mazdyasna S. Gingival recession in the lower incisor region of 15-year-old subjects. J Periodontol 1980;51:74-6. 7. Sullivan HC, Atkins JH. Free autogenous gingival grafts. 3. Utilization of grafts in the treatment of gingival recession. Periodontics 1968;6:152-60. 8. Miller PD Jr. A classification of marginal tissue recession. Int J Periodontics Restorative Dent 1985;5:8-13. 9. Smith RG. Gingival recession. Reappraisal of an enigmatic condition and a new index for monitoring. J Clin Periodontol 1997;24:201-5. 10. Mahajan A. Mahajan's modification of miller's classification for gingival recession. Dental Hypotheses 2010;1:45-50. 11. Nordland WP, Tarnow DP. A classification system for loss of papillary height. J Periodontol 1998;69:1124-6. 12. Pini-Prato G. The Miller classification of gingival recession: Limits and drawbacks. J Clin Periodontol 2011;38:243-5. 13. Miller PD Jr. Root coverage using the free soft tissue autograft following citric acid application. III. A successful and predictable procedure in areas of deep-wide recession. Int J Periodontics Restorative Dent 1985;5:14-37. 14. Paolantonio M, di Murro C, Cattabriga A, Cattabriga M. Subpedicle connective tissue graft versus free gingival graft in the coverage of exposed root surfaces. A 5-year clinical study. J Clin Periodontol 1997;24:51-6. 15. Trombelli L, Scabbia A, Wikesjö UM, Calura G. Fibrin glue application in conjunction with tetracycline root conditioning and coronally positioned flap procedure in the treatment of human gingival recession defects. J Clin Periodontol 1996;23:861-7. 16. Cairo F, Nieri M, Cincinelli S, Mervelt J, Pagliaro U. The interproximal clinical attachment level to classify gingival recessions and predict root coverage outcomes: An explorative and reliability study. J Clin Periodontol 2011;38:661-6. 17. Aroca S, Keglevich T, Nikolidakis D, Gera I, Nagy K, Azzi R, et al. Treatment of class III multiple gingival recessions: A randomized-clinical trial. J Clin Periodontol 2010;37:88-97. 18. Mombelli A. Clinical parameters: Biological validity and clinical utility. Periodontol 2000 2005;39:30-9. 19. Altman DG, Gore SM, Gardner MJ, Pocock SJ. Statistical guidelines for contributors to medical journals. Br Med J (Clin Res Ed) 1983;286:1489-93. 20. Addy M, Newcombe RG. Statistical versus clinical significance in periodontal research and practice. Periodontol 2000 2005;39:132-44. 21. Sterne JA, Curtis MA, Gillett IR, Griffiths GS, Maiden MF, Wilton JM, et al. Statistical models for data from periodontal research. J Clin Periodontol 1990;17:129-37. 22. Dupont WD . Statistical Modeling for Biomedical Researchers: A Simple Introduction to the Analysis of Complex Data. Cambridge: University Press; 2002. Kumar, A., Sood, V., Masamatti, S.S.,Khatri, M., Agarwal, V.